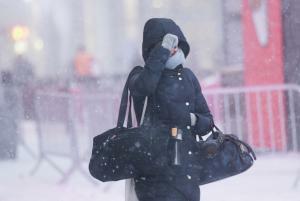 March 6 (UPI) — Nearly two dozen states were under winter storm alerts Tuesday for blizzard conditions that hit the central Plains and are making their way to the Northeast. This latest storm, the second significant winter system in less than a week, is expected to deliver heavy snow and winter storm warnings from Pennsylvania to Maine, and could cause travel problems for much of the Northeast over the next two days. Strong winds are expected again, which could cause additional damage, power interruptions and some coastal flooding, forecasters said. Snowfall Tuesday stretched from the Minnesota to Wisconsin and into parts of Michigan, while thunderstorms headed for the Tennessee Valley and New Orleans. In Minnesota, hundreds of traffic accidents were related to the winter weather, officials said. Snowfall and rain showers will begin near Philadelphia Tuesday evening and continue to New York around midnight. Once the storm strengthens, forecasters said heavier snow will move into New England, with Boston seeing a rain-and-snow mix. Snow is expected to fall at 2 inches per hour in some locations in the Northeast on Wednesday. Experts said snowfall totals cold reach 5 inches in Boston, 10 inches in Philadelphia and perhaps a foot in New York City. At least seven people, including two children, died in Pennsylvania, Connecticut, Rhode Island, New York, Maryland and Virginia during the first nor’easter, which blasted the region late last week. Winds toppled power lines and rains flooded coastal towns throughout the Northeast, as about 2 million homes and businesses lost electricity.